I have trouble with my own images sometimes. Certainly not because they are objectionable to some people….people who, in my estimation, are likely not those that prefer raw truth in any form and are therefore out of my reach or sympathies. I sit with people and see, hear, smell and feel things that are completely removed from the realm of an everyday suburban American experience. I sometimes can’t believe it when someone relates an event that is, for example, an unjustifiable, random act of cruelty that would only be perpetrated by someone who feels a sense of complacency and impunity. The safety and anonymity brought about by the almost total lack of supervision on these streets, streets that are an almost guaranteed safe haven for sexual predators of all kinds, both the previously incarcerated and therefore in the system kind and the neighborhood dad who lives across the street in any American suburb kind. He walks to school with his elementary school aged children and could be anybody anywhere. Both troll the neighborhood in daylight hours. 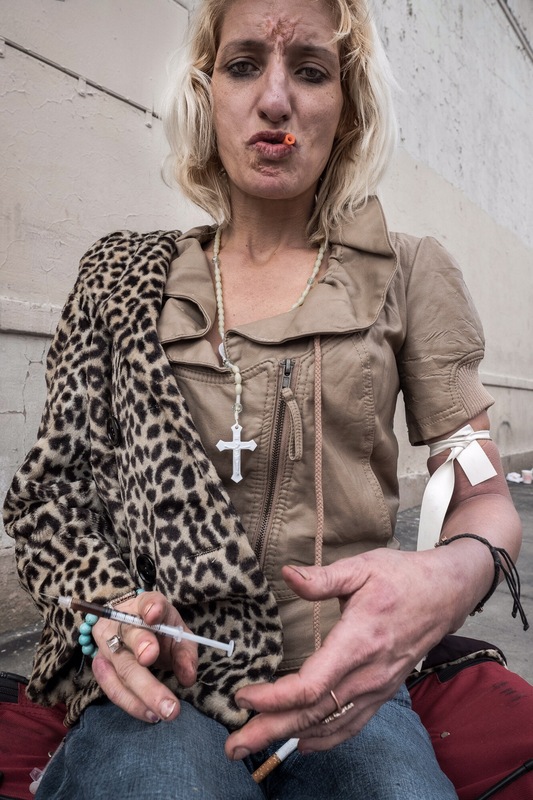 I’ve also witnessed women I’ve photographed, while in the process with me and my camera, in the street, being approached/solicited by everyday casual-looking women driving along key streets in Skid Row. Sometimes my own naively assuming nature blinds me in the moment, disbelief and naïveté blending with my absolutely selfish desire to bull through any event no matter how disruptive or disturbing in order to create the images that I see before me. One month in the hospital explained why I haven’t seen her. A lung infection that was almost fatal and would’ve been for most….but anybody that can survive a great deal of hard drug use, homelessness and exposure to all kinds of pathogens is much more resilient internally and externally than the rest of us. I thought she looked at her prettiest. She was rested and healthy and spoke with clarity, very little of the intensely rushed and pressured speech that I’d often heard in the past. Her skin was clear and untarnished by blemishes or sores. Although truly underweight–dangerously so–she was logical in her approach to conversation and was a pleasure to spend time with, until a bit later, when I was able to see the accumulated effects of drugs used, stress, and memory.